Joe McGhee winning the SAAA Marathon for the third time. Writing about Joe McGhee’s career in the sport is difficult because although it is possible to list races and reprint reports, he himself refused to do any talking to the Press, or indeed to anyone, after the Empire Games race in 1954. I have a separate page on this race under the title of ‘Vancouver 54’ which is mainly comprised of reports from the ‘Scots Athlete’ and there will be extracts from the Scottish Marathon Club Minute book included later this week. I’ll start with some basic statistics. Joe McGhee was an English teacher at St Modan’s High School in Stirling and a member of St Modan’s Athletic Club until 1954 when, already a champion athlete, he joined Shettleston Harriers for whom he ran many good races in the National Cross Country Championships and especially perhaps in the Edinburgh to Glasgow Relay Race where there was a rivalry with Ian Binnie of Victoria Park. The combination of the time for training afforded by the RAF plus the coaching from Allan Scally turned him into an even better runner. He won the Scottish Marathon Championship in 1954, 1955 and 1956, the Donald McNab Robertson Trophy, awarded annually as a joint decision by the SMC and the SAAA’s, in 1953, 1954, 1955 and 1956 and represented Scotland in the International Cross Country Championship in 1954, 1955 and 1959. There can be no doubt about his quality as an athlete. Some of his career details will be printed below and added to as I have more information about him. ‘A Hardy Race’ reports McGhee running in the SAAA Marathon Championship of 1951 and finishing sixth ahead of such as Emmett Farrell and Andy Brown of Motherwell. A year later he ran in the Windsor to Chiswick course in the AAA’s marathon, which was the Olympic Trial Race, and recorded 2:39:29. In the Scottish arathon in August Chick Robertson was the man and although Joe tried to stay with him he was dropped by half distance and finished fifth ahead of some very good men – Alex Kidd, Harry Haughie and Andy Brown. The Minute Book of the Scottish Marathon Club for 16th November 1953 have an item on the Robertson Trophy. “The sub committee met on Wednesday 11th November present being Messrs Wright, Scott and Walker from this club and Messrs McSwein, Dallas and Graham for the SAAA. Each member was given a typewritten list of the performances by Joe McGhee, Harry Howard, Alex Kidd and Ian Binnie. 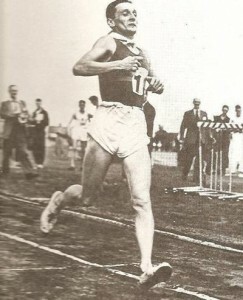 After due consideration, it was agreed that the Trophy be awarded to Joe McGhee, St Modan’s AAC for his consistent high standard of running throughout the season in 14 races, and particularly for his fine performance in the Perth – Dundee Road Race on 29th August 1953 when he beat the existing record in the name of C.D. Robertson who was awarded the Trophy in 1952.” This was to be the first of many honours that Joe was to pick up. I don’t have details of all the races that led to the award but the following can be taken as representative of his form. By the beginning of the 1953 – 54 cross country season he had joined Shettleston Harriers, one of the top two clubs in Scotland. He was also benefiting from the training done in the RAF and coaching done by Allan Scally. In the 1954 National he helped his team to win the title and gained his first Scottish vest by finishing seventh. On the roads, he was chosen for the Scottish team for the Empire Marathon – the only man so selected – because the selectors did not view the SAAA Marathon as a ‘trial race’. His form and fitness kept improving and the SAAA Marathon Championship n May showed this to perfection. The course went from the Cloch Lighthouse at Gourock to Glasgow. The time at 5 miles was 27:11 with Duffy, McGhee, Lawrence and King were all together. Lawrence from Gala broke away with only McGhee going with him. At 15 miles after the long climb up to Langbank, Joe took the lead and Lawrence dropped out. Duffy also dropped out here. Joe pushed on covering the next 5 miles in 30:36 and went on to win in a championship record of 2:35:22. Conditions were so difficult and the trail a hard one and only seven of the twenty six starters finished the race. Among those who retired were such as the reigning champion Duffy and Scottish stalwarts such as Andy Fleming, Willie Gallagher, Gordon Porteous, David Bowman, Eddie Campbell and David Anderson. Duffy as reigning SAAA Champion was particularly disappointed not to have been pre-selected for the Empire Games (Jim Peters had interceded on his behalf but to no avail) and when he saw that he was not going to qualify here it probably influenced his decision to drop out at 15 miles. Only one week later Joe won the Dundee Corporation 13 mile road race in 1:07:42 from Chick Robertson who recorded 1:12:23. The following year was another good one for Joe. He won the SAAA Marathon in a very fast 2:25:50 and when it came to the award of the Robertson Trophy it was unanimously awarded to him for that run. Incidentally there was a total of 15 runners inside the standard time of three hours which some said was a response to Joe’s fine run in Canada a year earlier. ‘A Hardy Breed’ again “By the time the Scottish Marathon came round again on 25th June over the Falkirk to Edinburgh Course, Joe McGhee was even fitter and ready to show that he was a worthy Empire Games champion, as well as supreme in Scotland. Emmett Farrell, himself 6th in 2:48:44, wrote that ‘Joe McGhee’s record breaking 2:25:50 was easily the feat of the SAAA Championships and puts him in world class and an extra glitter on his British Empire gold medal. Conditions were excellent but the course is by no means an easy one and this enhances the performance of George King whose time of 2:34:30 beat the previous best ever in Scotland and that of Hugo Fox with a 2:37:35.” Unfortunately he was unable to run in the AAA’s marathon because of a leg strain otherwise who knows what might have happened? He also had to retire in the late season Edinburgh Marathon but had a good season on the roads before tackling the 1956 road racing season. But this was where Harry Fenion from Bellahouston comes into the story. Harry was a first class athlete who had come up through the ranks and was a real class act. Built like Dunky Wright it is hard to say who would have had to look up to the other but with a lot of talent. Harry won the Clydebank – Helensburgh 16 miler by a minute and a half and that form continued up to the marathon. There was some anxiety about Joe’s fitness after a series of poor runs and dnf’s due to injury but on the day Joe won in 2:33:36. Joe set a fast pace right up to the 20 mile mark on a warm and sultry afternoon and several good runners dropped out. Harry Fenion kept with him right up to the 23 mile mark when he dropped out because of blisters. This was Joe’s third successive SAAA Marathon Championship – no one equalled the feat until Fraser Clyne from Aberdeen won it in 1992, 1993 and 1994. Next year was Harry’s and he won in a new best time of 2:25:44.